In December, Vibrant Warsop supported the delivery of the Warsop Christmas Fayre, which received £1,000 of funding from Big Warsop. 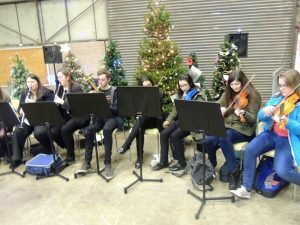 The indoor event was arranged, managed and delivered entirely by a group of fifteen local volunteers. 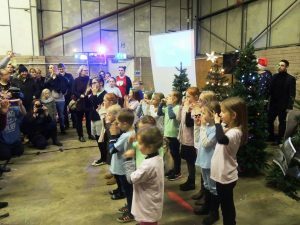 It was hosted by Warsop Youth Club at The Shed, which provided the large under cover venue needed to welcome the various stallholders, fairground rides, and accommodate the 800 local people who visited the fayre. The event was a chance to buy Christmas gifts and crafts from the stalls, visit Santa’s Grotto, and find out about local events, activities and organisations from a variety of information and display stands. Support for the Christmas Fayre was also provided by Warsop Inner Wheel, Warsop and Shirebrook District Rotary Club, the local Fire and Rescue service and a group of customers from a local pub. Visitors were entertained during the evening with performances by children from Meden School and Birklands Primary School. The Voices of The Vale Children’s choir also delivered their first ever performance at the fayre, to a very appreciative audience. The Christmas event was part of a programme of activities being delivered by Vibrant Warsop as part of the Strengthening Community Theme. The aim of the project is to promote local volunteering opportunities, develop information exchange and networking, deliver a personal development programme to build capacity and confidence, and support community groups by providing information about funding opportunities, grant applications and legal requirements. Following the success of the Christmas Fayre and the positive feedback received from those who attended, Vibrant Warsop and volunteers are already planning more local events, including another Christmas Fayre in 2017. Big Warsop will share information about upcoming events here on our website and also on our Facebook and Twitter pages. Read the latest activity report from Vibrant Warsop here on our website.